OUTTAKE VOICES™: Boston's 40th Gay Pride "RIOTS to RIGHTS"
Boston's 40th Gay Pride "RIOTS to RIGHTS"
In this exclusive audio interview Emmy Winner Charlotte Robinson host of OUTTAKE VOICES™ talks with Keri Aulita, Deputy Director of the Boston Pride Committee, about this year’s events. Boston’s Pride celebration starts June 4th and runs through Sunday June 13th. In celebration of the 40th anniversary of Boston Pride this year’s theme is "Riots to Rights – Celebrating 40 Years of Progress", honoring the 1969 Stonewall Rebellion that commenced the modern Gay Rights movement and commemorates the progress our community has made since those early days of the battle for equal rights. 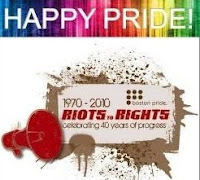 One of this year's highlights is a "Riots to Rights" rally on June 10th at 6 pm at the Stuart Street Playhouse, 200 Stuart Street, Boston, MA., that features guest speakers Stuart Milk, nephew of Harvey Milk, Founder of the Harvey Milk Foundation and pioneer gay activist Cleve Jones of the NAMES Project AIDS Memorial Quilt. This will be followed by a free screening of the must-see documentary “Beyond Gay: The Politics of Pride” which opened the Boston LGBT Film Fest last month. Director Bob Christie’s moving documentary is about Gay Pride marches and festivals happening all over the world, sometimes under heavy opposition and violence.